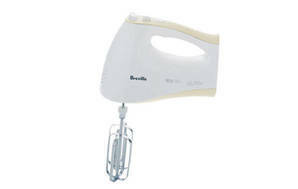 Snapshot: The Breville EM3 Wizz Mix hand mixer has 5 speeds and a pulse option. How well does it beat and mix? Good results in our beating (egg whites) test. Excellent results in our mixing (cake batter) test. Comes with a dough hook. Has many crevices where food can get trapped (so it’s fiddly to clean).